I was checking the buds of Malus ioensis ‘flora-plena’, hoping to see them fattening up and promising to flower soon, when I got to thinking about double flowers. What causes a plant to produce double flowers? As you would expect, it is all to do with genes, and in this case, faulty gene expression. Funny to think that what we see as a desirable and beautiful trait is in fact a gross mutation of sexual organs! In normal flower development, genes encode proteins that develop either sepals (the outer protective parts of the flower), petals, stamens or carpels. The last two are the basic structures of the sexual parts of the flower. If the genes that control these are damaged, they fail to encode the protein for the development of the sexual parts, and instead they default to petal production. This creates the additional petals that create the ‘double’ flower.The flower, in effect, has a genetic hierarchy that means that even with a faulty gene for production of the sexual part of the flower, a flower is still produced. There can be graduations in the fault, where a flower has additional petals but retains some sexual parts, though less than a normal flower. From an evolutionary point of view, there are two interesting points to note about this. Firstly that if a plant produces fully double flowers it can’t reproduce sexually, as there are no sexual parts to the flowers. So, at first glance, it would be expected the mechanism that creates a ‘default’ double flower would have been bred out through natural selection a long time ago. However, because new double flowered plants arise naturally regularly, it seems there is a benefit to retaining the mechanism that creates the double flower. Possibly this is because, whilst one flower may mutate, others may be properly formed, so the double flower still acts to attract pollinators, who might visit the fertile flowers. It may also be that if an individual plant mutates into double flowers, the flowers still attract pollinators who will also visit other plants of the same species nearby, and therefore the species as a whole benefit. Oddly, though most plants produce sterile double flowers, there is one plant that naturally has double flowers all the time. The humble dandelion is a botanical oddity, both because of it’s naturally double flowers, and also because it can set seed without fertilization. 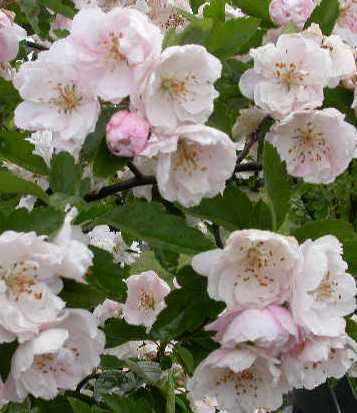 Finally, to get back to the tree I mentioned at the beginning of the entry, Malus ioensis ‘Flora-plena’ is an example where there is some variation in the extent to which petals replace sexual parts. This means that most flowers will have some amount of fertile parts, and occasionally fruit will be produced. And what about the name ‘flora-plena’ ? It is Latin for ‘with full flower’. So if you ever see that name attached to a plant, you’ll know that it is double flowered.